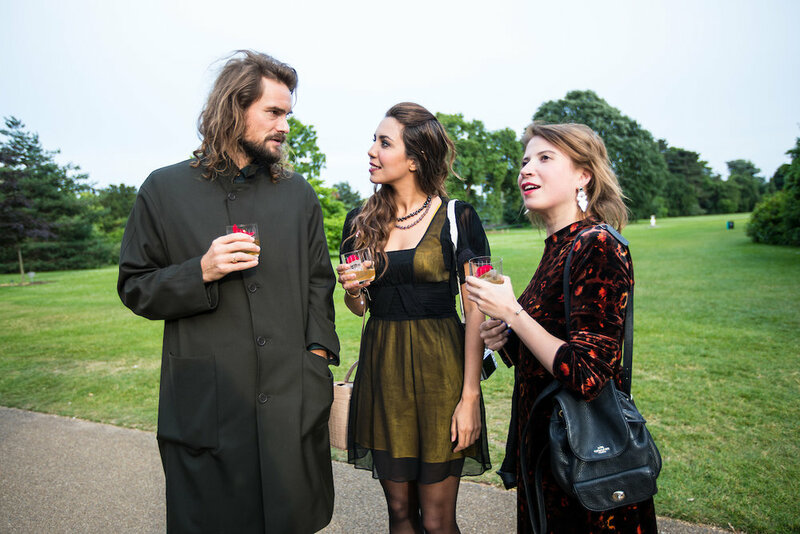 Kew Palace Royal Salute Whisky Launch — The London Journalist. The London Journalist's Christabel Milbanke was delighted to attend the summer launch of Royal Salute's exquisite new 28 Year Old Kew Palace Edition, the latest in its annual Flask Collection, at Kew Gardens. Inspired by the magnificent Kew Palace and the magic of its iconic Kitchen Garden, Royal Salute's Director of Blending Sandy Hyslop and the debonaire perfumer Barnabé Fillion have joined forces in a unique first-time collaboration resulting in a majestically rich, round and silky blend that stimulates the senses and arouses the imagination. Unfolding from a beautifully designed boxed invitaiton, sent by post, the Royal Salute 'Kew Palace' journey represented to me a welcome and enchanting return to doing things properly. -As one would might expect from a, former Royal Warrant holders, Chivas Brothers whisky. Launched by the Chivas brothers in 1953 as a tribute to the British monarchy upon the coronation of Queen Elizabeth II, Royal Salute remains one of the most traditional and regal of the blended whisky's produced at the historic Strathisla Distillery; the oldest working distillery in the Scottish Highlands. This royal tradition of excellence was exhibited from the early evening arrival at the grand old gates of Kew, where guests were gently intercepted by costumed courtiers dotted across the gardens and escorted to the Royal Palace and former home of King George II where the Royal Salute reception was held. Following the format of a traditional British summer party, a string duo elegantyl elevated the atmosphere with tasteful arrangements of familiar modern songs while guests sipped on an exceptionally decadent whiskey cocktail, featuring the essence of the extremely rare and expensive May Rose - exclusively grown in a field in the French Rivieria mostly owned by fashion house Chanel for their iconic fragrances. These unusually extravagant cocktails truly set the standard for the rest of the event. Indeed, every stage of the sunlit evening was handled with offensively great style and deliberation. - No detail too small and no expense spared. No suprise then that this concoction, alongside the Kew Palace limited edition whiskey itself, was created by the charismatic and strikingly debonaire French perfumer Barnabé Fillion. Who is, Incidentally, Royal Salute’s new Creative Advisor and Brand Ambassador. I spoke with the lovely Barnabé at length about his remarkable occupation which began as a photographer and student of Helmut Newton and led to a career in perfumery, with a spell at Hermes no less, due to his love affair with the language of scent. Cheryl Caira and Christabel Milbanke at Kew Palace. Esteemed perfumer Barnabé Fillion, journalist Christabel Milbanke and editor of Scottish Woman Magazine Cheryl Caira. 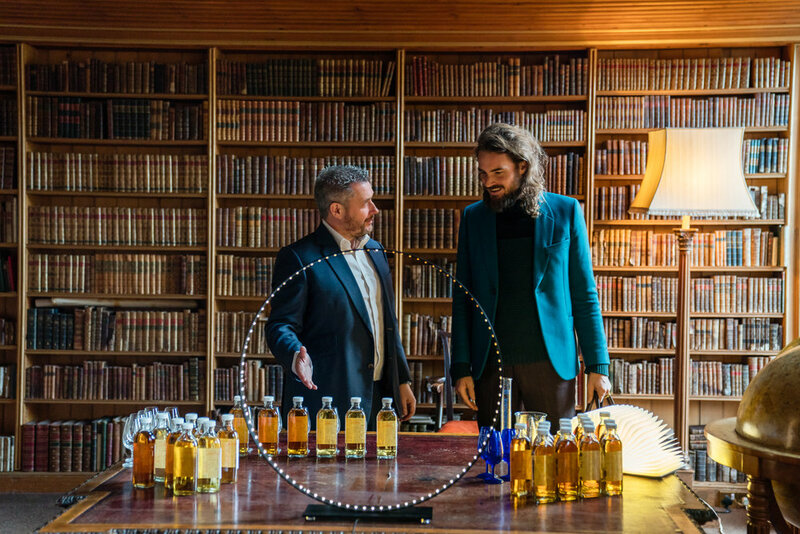 Guests were then escorted on a tour around the Kitchen Gardens which culminated in a Whisky Blending Masterclass in the Palace Kitchen which demonstrated the delicate process the charming collaborators Sandy Hyslop and Barnabé Fillion went through to create this truly unique whisky. Master-blenders Sandy Hyslop and Barnabé Fillion at Kew Palace Kitchen. Master-blenders Sandy Hyslop and Barnabé Fillion in Hyslop's blending room in Scotland. After an adventure in scent, nosing each and every one of the bouquet of pure flavours including 'Sherry Spice', 'Fruit', 'Citrus Flower', 'Cream' and 'Smoke', we took to carefully adding measured amounts to our very own whisky, using the Kew Garden's limited edition as the base point. Nose: Intensely fruity with rich notes of ripe pear and a hint of aromatic autumnal leaves, alongside delicate floral notes of violet. Taste: Rich, round and perfectly balanced with sweet natural honey flavours and scented flora. Finish: A deliciously long, smooth and sweet finish with a wisp of smoke. Personally favouring creamier whiskys I emptied the entire 'Cream' bottle into my already delicious base blend, while my companion Cheryl Caira editor of Scottish Woman magazine boldly held on her roots and enough of the dangerously strong 'Smoke' into her bespoke bottle to put hairs on your chest. This exercise proved a lot of fun and was a great way to showcase just how much fun these two whisky-loving compadres had when coming up with the Kew Palace edition. Blending complete, a small sample of the finished product and our tasting notes were left for, former Royal Household chef, Darren McGrady. His, seemingly impossible, challenge for the evening being to produce a unique three-course meal specifically designed to complement each guest's unique whisky blend. Naturally. 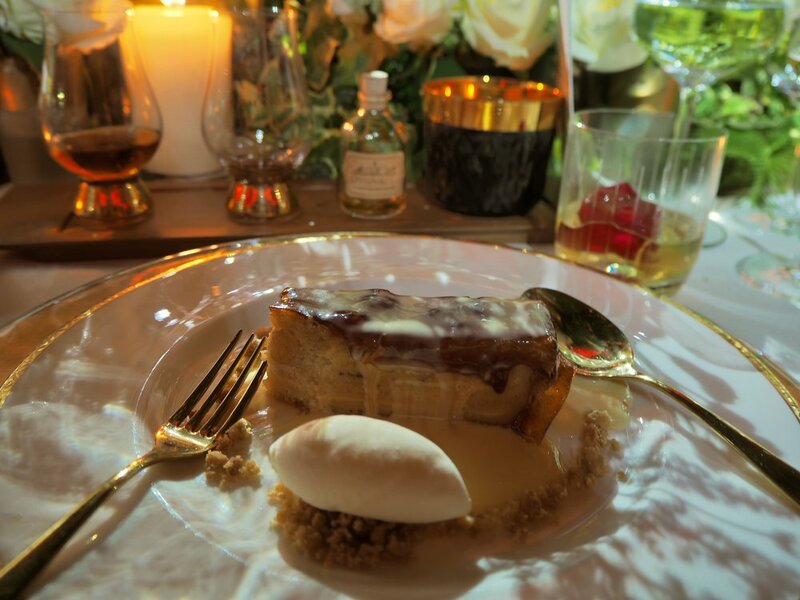 The dinner itself was as delightful as it was royally decadent, featuring live guitar, poetic floral displays and behind the scenes stories from the Royal Household. However the most majestic elements of the evening remained the warm amber glow of fine whisky against the absolutely incredible, historic backdrop of Kew Palace and Gardens. Many thanks to the team and all involved for creating an unforgettable evening of historic proportions, and of course reminding us all how to host a proper party. The Kew Palace Edition follows the launch of the Royal Salute 30 Year Old Flask Edition last year, and this next iteration in the collector’s series again offers a disruptive take on traditional British drinking traditions. The perfect companion for whisky aficionados on the move, the set includes a bespoke green porcelain flagon and exquisite flask, alongside a pouring funnel and wooden serving tray. It pays homage to London’s iconic Kew Palace, one of Historic Royal Palaces’ most charming royal residences, as part of Royal Salute’s longstanding support of the independent charity created to preserve and protect great British icons. The Palace and its famed Kitchen Garden are showcased on the stunning packaging through artwork from esteemed British illustrator, Jason Brooks. This next iteration in the collector’s series will be available in selected stores from June 2018, for a limited time and at a RRP of $790/70cl.